Flight Of The Conchords seems to be atoning for its sins of going on hiatus to focus on cinematic things with the Flight Of The Conchords Sing Flight Of The Concords tour. 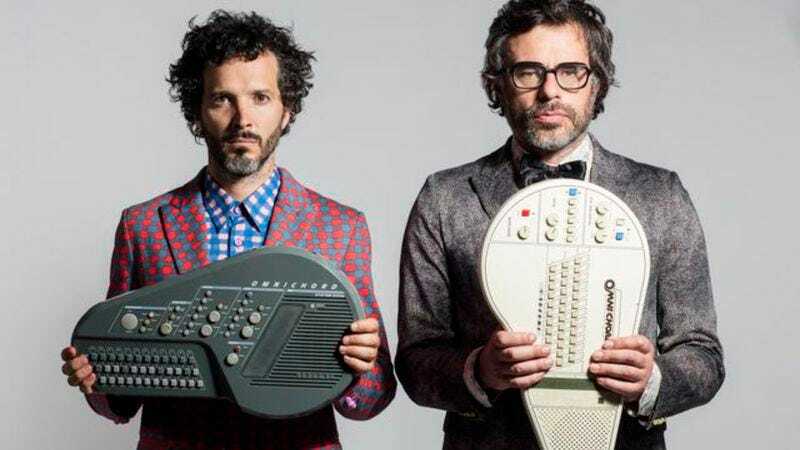 Not only did members Jemaine Clement and Bret McKenzie recently add more dates to the tour, but they’ve just announced that they’re bringing featured players from their HBO series on the road with them. Eugene Mirman and Arj Barker, who played their creepy landlord and smarmy pal, respectively, on the Flight Of The Conchords show are just two of the band’s supporting acts. They’ll also be joined on tour by John Hodgman, Demetri Martin, Michael Che, Nerdist podcaster Kurt Braunohler, and Irish comedian David O’Doherty for select dates. The complete dates are below, though many are already sold out. We realize that the news of these supporting acts might make the sold-out shows all the more disappointing to miss, which is why it’s just been raining on your face. June 28—Shoreline Amphitheater—San Francisco, CA !